I am a 29-year-old girl woman that squealed like a 13-year-old at a One Direction concert(they're still relevant, right?) when I opened up the envelope that contained this book. I have loved everything Jay Asher since his debut, 13 Reasons Why. When I heard way back when that he was coming out with a new Young Adult the long wait began! As soon as this gem made it into my hands, I hungrily started into it; like pumpkin pie on Thanksgiving! But What Light was much sweeter and far more decadent than any Pumpkin Pie. In Ontario, Canada we had an unusual burst of summer heat that is not the norm for this time of year in Autumn, but I preferred to stay home and devour this sweet tale of young love, redemption, and personal growth. What Light contains such a lovely character cast. Just regular, down to earth characters. I could actually see a lot of myself, my family and my friends in these characters. I adored Sierra. I truly did. She doesn't live your typical life. She has her life in Oregon where her family runs their Christmas Tree Farm, and then she has her life in California where her family packs up every year to sell said Trees at Christmas Time. Sierra's character was so refreshing to read. She's your funny, typical teenager. I would love to get inside Jay Asher's brain to check out his Character Crafting process. Despite these characters being normal, everyday people, he made them all so grand and memorable! And speaking of memorable, enter Caleb...Swoon! Yes, I am a near 30-year-old, swooning over a fictional, teenage character...No Shame! But Caleb's swoon-factor is much deeper than just his appearance. He is thoughtful, generous, and caring. He is also fighting his own battle against himself that unfolds throughout the story. 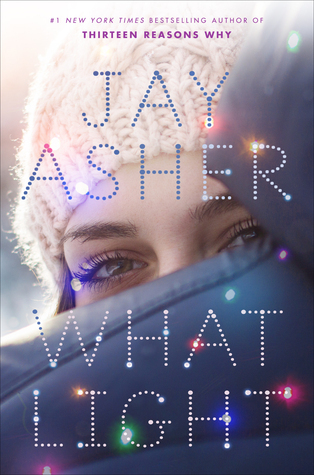 What Light is definitely a lighter read compared to 13 Reasons Why but it still contains all of the great qualities that make Jay Asher such a wonderful writer. What Light has become one of my favourite Christmas stories; one that I will return to each year. It's colourful charcters and beautiful setting will have your senses tingling. You can practically smell the beautiful scent of pine needles, hot chocolate, and candy canes while eating up this scrumptious tale! We all deserve to treat ourselves, which is exactly why you should spoil yourself What Light this holiday season! I am SO excited for new Jay Asher!! I've had this book for a few months now, but haven't been in the mood to read something Christmasy. Maybe I'll be in that mood once the weather changes around here!